Haydn: Piano Concertos Nos. 3, 4 & 11 | Bernard Labadie | Dispeker Artists, Inc.
Marc-Andre Hamelin has proven himself - in three highly lauded volumes of Haydn's piano sonatas - to be a formidable Haydn pianist, combining style, exuberance and dazzling technique with a palpable sense of joy in the music. This release is the fruit of a partnership with the award-winning Canadian chamber orchestra Les Violons du Roy and their director Bernard Labadie, whose previous recordings for Virgin Classics and other labels have received the highest critical acclaim. 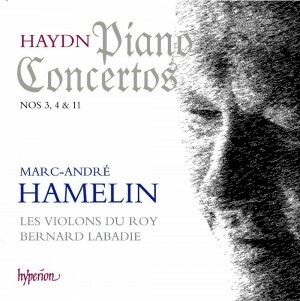 With his scintillating performances of Haydn's three most popular Piano Concertos, Hamelin further demonstrates his special affinity for this repertoire.